The series-e polychair is offered in a choice of six sizes. All models are stacking and have passed the rigorous performance tests for strength and suitablility for severe contact applications. The overall minimum quantity is 12 chairs. 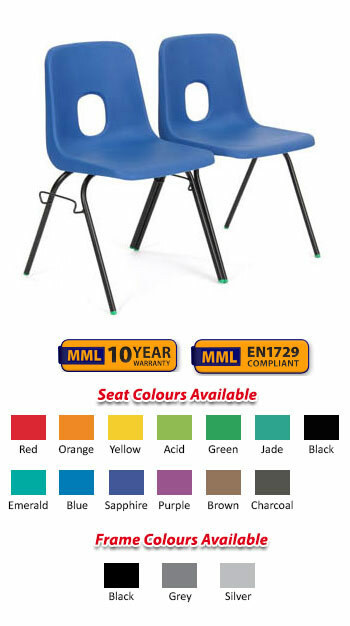 You can mix and match colours and sizes to reach the overall minimum quantity of 12 chairs. Please call 01257 425464 for smaller quantities. . 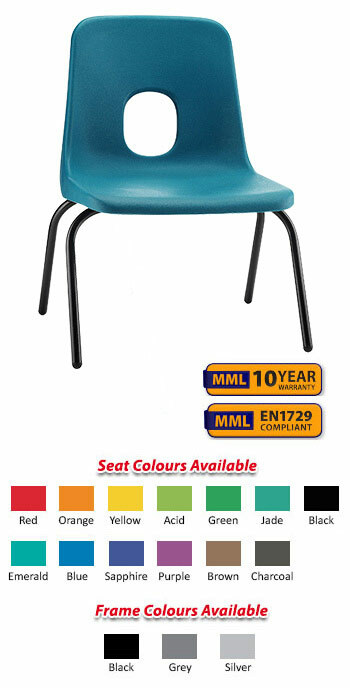 The series-E polychair fitted with fire retardant polyproplyene seat shells, designed for applications where regulations require a fire retardant product, for example in school halls. Offered in a choice of six sizes, all models are stacking and have passed the rigorous performance tests for strength and suitablility for severe contact applications. We often see Teachers sitting on size 1 or 2 chairs which is great to interact with the children but the seats are simply not the correct width or depth hence we developed a standard size shell chair but at a size 2 junior height to offer a best of both worlds solution. The overall minimum quantity is 12 chairs. 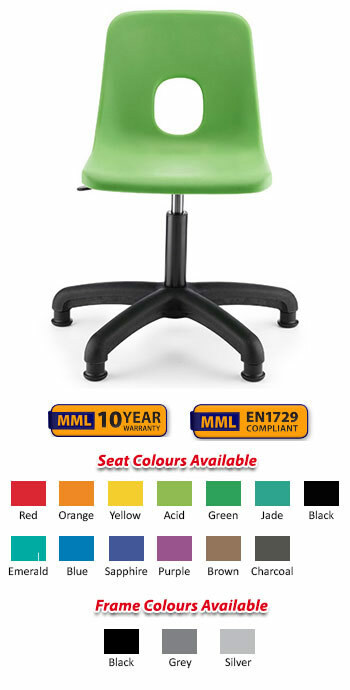 You can mix and match colours/chairs from this and any other chair in the "Series-E" range to meet the minimum quantity. Please call for smaller quantities. 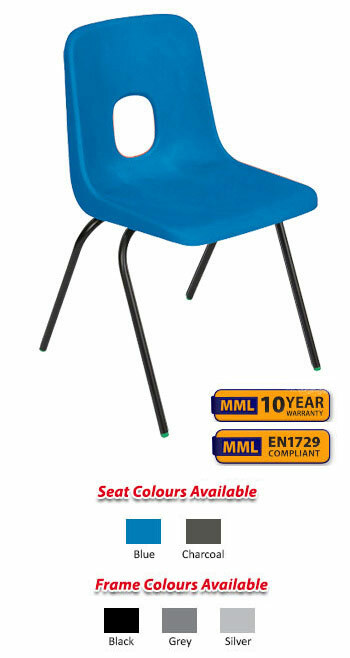 The series-e polychair is offered in a choice of six colours in the adult height - size 5. All models have passed the rigorous performance tests for strength and suitablility for severe contact applications whilst the shells are also avaliable with fire retardant properties. Ideal for use in areas where tables are not used but students need to have somewhere to make notes. The tablets conveniently fold to the side and then behind the chair to give the ultimate flexibility of usage. The overall minimum quantity is 8 chairs. 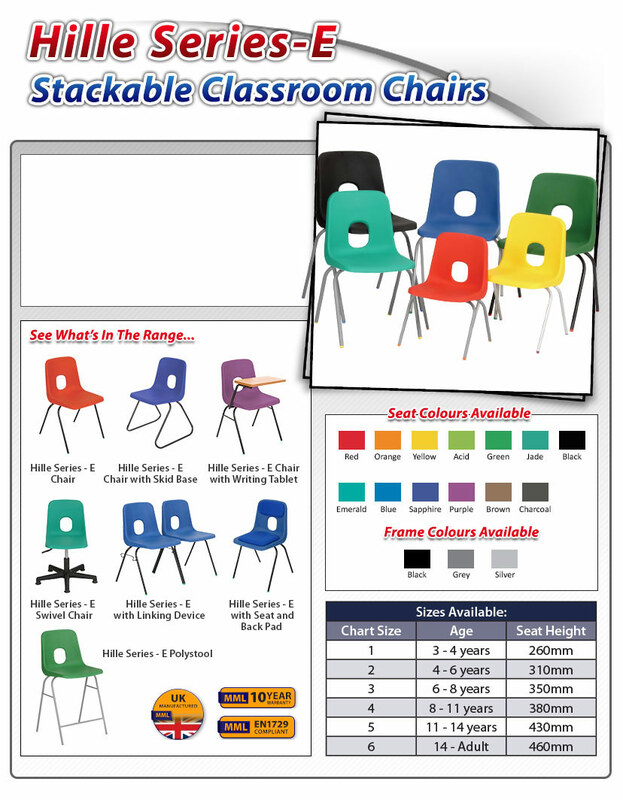 You can mix and match colours and sizes to reach the overall minimum quantity of 8 chairs. Please call 01257 425464 for smaller quantities. . This chair is the same as the standard Series-E polychair with the addition of a sleigh-style skid base to prevent floor scratching. This model can also stack and has passed the rigorous performance tests for strength and suitability for severe contact applications whilst the shells are also available with fire retardant properties. Height adjustable swivel chair with 5-leg nylon base available with your choice of either glides or castors. The height is adjusted by a one-touch gas adjustment lever, allowing you to safely and easily alter the height to your preference. The overall minimum quantity is 4 chairs. 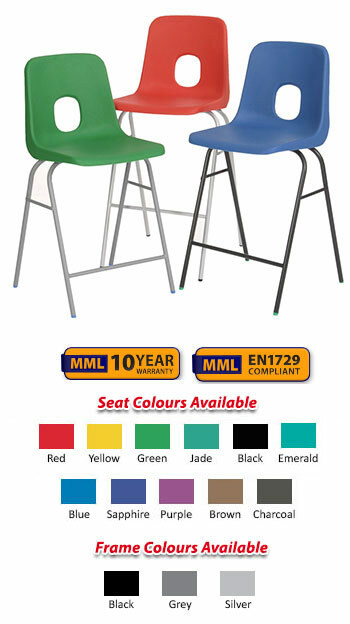 You can mix and match colours and sizes to reach the overall minimum quantity of 4 chairs. 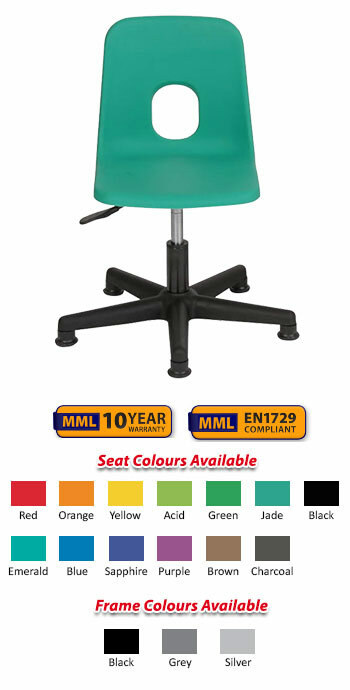 Please call 01257 425464 for smaller quantities. .
Height-adjustable swivel chair with 5-leg nylon base available with your choice of either glides or castors. The height is adjusted by a one-touch gas adjustment lever, allowing you to safely and easily alter the height of the seat to your preference. Hille Series-E Chair with welded metal linking device allowing you to attach chairs together neatly and securely. Ideal for assemblies and performances. 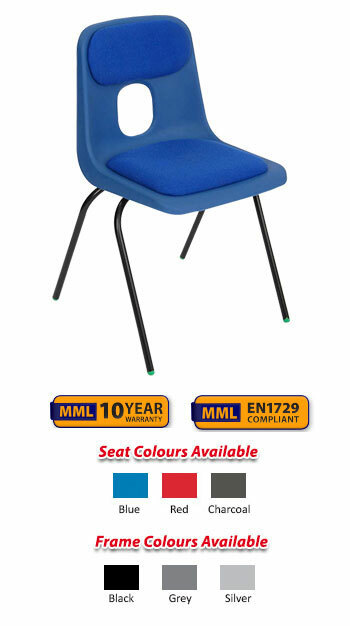 Hille Series-E Chair fitted witha comfortable upholstered seat and back pad (also available with seat pad only).